The Applications and Places menus. The Applications menu is displayed at the top left of the screen. It gives the user access to applications organized into categories. The user can also open the Activities Overview from that menu. The Places menu is displayed next to the Applications menu on the top bar. It gives the user quick access to important folders, for example Downloads or Pictures. a short identifier for the current workspace and total number of available workspaces displayed next to the notification icon. In GNOME Classic, the number of workspaces available to the user is by default set to 4. Window titlebars in GNOME Classic feature the minimize and maximize buttons that let the user quickly minimize the windows to the window list, or maximize them to take up all of the space on the desktop. A traditional Super+Tab window switcher. In GNOME Classic, windows in the Super+Tab window switcher are not grouped by application. The system menu is in the top right corner. You can update some of your settings, find information about your Wi-Fi connection, switch user, log out, and turn off your computer from this menu. GNOME Classic is distributed as a set of GNOME Shell extensions. The GNOME Classic extensions are installed as dependencies of the gnome-classic-session package, which provides components required to run a GNOME Classic session. Because the GNOME Classic extensions are enabled by default on Red Hat Enterprise Linux 7, GNOME Classic is the default Red Hat Enterprise Linux 7 desktop user interface. The user can switch from GNOME Classic to GNOME by logging out and clicking on the cogwheel next to Sign In. The cogwheel opens a drop-down menu, which contains GNOME Classic. For all newly created users on Red Hat Enterprise Linux 7, GNOME Classic is set as the default session. To override that setting for a specific user, you need to modify the user's account service in the /var/lib/AccountsService/users/username file. See Section 14.3.2, “Configuring a User Default Session” for details on how to do that. 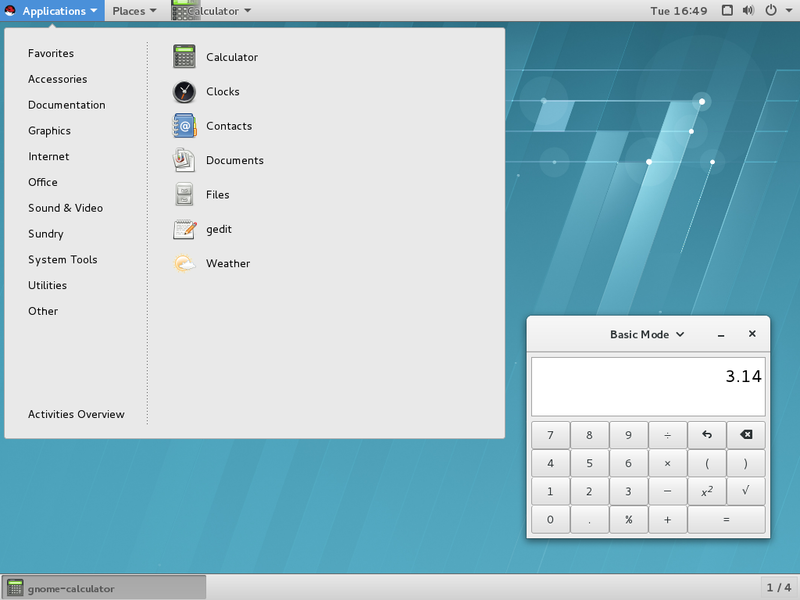 Users can find more information on using GNOME 3, GNOME Shell, or GNOME Classic in GNOME Help, which is provided by the gnome-user-docs package. To access GNOME Help, press the Super key to enter the Activities Overview, type help, and then press Enter.